Determining the value of some of that old gear taking up space in your closet or garage might become a lot easier if you have a Google Home. 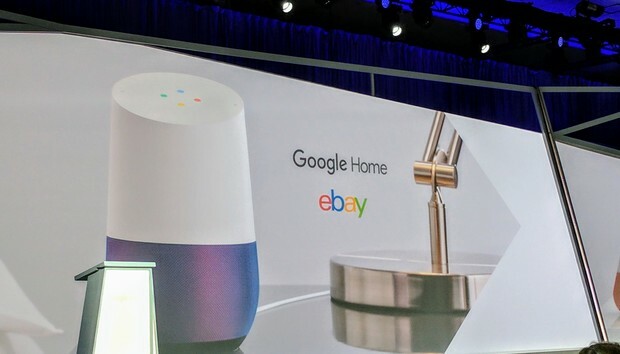 In an onstage demo at Google Cloud Next, eBay chief product officer RJ Pittman showed how the online auctioneer might tie into Google's digital assistant. He started in by asking the bot if eBay could find the value of his Canon digital camera. “Hi, I’m eBay. I’m the world’s price guide. You can ask me what something is worth,” the bot introduced itself. The chatbot asked a couple of follow-up questions, including the model of the camera (it was an EOS 5D), if it was new, and its overall condition. The eBay bot then landed on a value of $2,548. This “digital concierge” is a key piece of eBay’s evolving strategy, according to Pittman. He didn’t demo how the bot would perform searches for related products, although the indication was that it could give you details about a wide range of items you might want to unload. “We’ve taken it to Google Home because we want to be inside the home,” Pittman said. There was no indication about when eBay's bot will become available to Google Home users, but we’ve reached out to Google for clarification and will update if we hear back. The onstage demo was part of the pitch for Google Cloud, which Google is using to take on Microsoft Azure, Amazon Web Services, and other competitors in the cloud-computing space. Along with the chatbot, eBay announced it was bringing some of the company’s business services to Google Cloud.